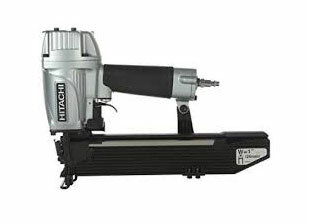 HITACHI. 18 gauge narrow crown stapler N3804AB3, 16 gauge standard crown stapler N5008AC2, 16 gauge wide crown stapler N5024A2. SENCO. Upholstery stapler SFT10XP-C, 18 gauge narrow crown staplers SLS20L17 & SLS20M17, 16 gauge standard crown stapler SNS200XP. PASLODE. 16 gauge, standard crown stapler S200S16, 16 gauge wide crown stapler S200W16. SPOTNAIL. 18 ga. medium crown stapler TS6825, 16 gauge standard crown stapler XS6650, 16 ga. wide crown stapler XS3640, 18 ga. flooring stapler WS4840W6. STINGER-NATIONAL NAIL. CH38 Plastic cap stapler and staples.